The Red Hook Innovation District is a $400 million project that would renovate 12 acres in the heart of Red Hook into multi-use structures that would preserve the neighborhood's traditional red-brick industrial look while adding public plazas and park space. Green corridors are an opportunity to transform and reinvigorate neighborhoods like Red Hook by enhancing circulation, absorbing or channeling runoff from rainstorms, and enabling the growth of vegetation. The goal of the Red Hook Coastal Park would be to provide a softer edge that offers views and recreation as well as protection. The design and implementation of a model block could encapsulate shared goals for living in a sustainable, equitable, and resilient community and serve as a template for development in Red Hook and beyond. BASF organized Creator Space™ New York City in 2015, with a focus on finding solutions that would improve the quality of life in the New York neighborhood of Red Hook as a case study relevant to coastal cities globally. The event pulled together a wide variety of stakeholders with extraordinary passions for this cause—Red Hook residents, local businesses, artists, scientists, engineers, and more—and engaged them in a multi-day co-creative exercise. It enabled collaborations with experts on urban living and city planning. The goal of those rich discussions was not merely to brainstorm but to develop a plan for implementing the best of the ideas. Development of buildings, spaces, and infrastructures that support a desirable way of life. Three types of environments come together to shape what we call the urban habitat: natural, built, and social environments. The future urban habitat is ideally a space where the natural and built environments come together to create a sense of place and community, while optimizing resources, ultimately resulting in low impact. Fostering spirits of community involvement, activism, and capability that go beyond simple consumerism. In contemporary developed societies, a consumer can act according to his or her private tastes without any responsibility for public justification. Citizens, on the other hand, have an obligation to search for a higher, common good. As citizens, individuals must accept limits to their autonomy, and take into account the impact of their own preferences and choices on others. They have rights and responsibilities to the body politic. In the public sphere of democratic self-governance, decision-making requires participation, discussion, and compromise. A citizen has an obligation to articulate his or her individual position and to reconcile it with the general one. The capacity to survive and efficiently recover from disruptive, potentially catastrophic events. Resilience is a measure of a system&rsquo;s capacity to absorb shocks and perturbations that might otherwise result in its breakdown. An original objective of the Internet, for example, was to create a network that would be resilient to disruption in case of attack because it was secure by design. Many of the basic infrastructural systems of developed societies are vulnerable to disruption. They may need to be redesigned to raise their local, self-reliant capacities to grow food, provide water and sanitation, generate energy, transport, repair, build, and finance. The objectives of resilient rebuilding are to integrate the dynamics of construction into the design of more adaptable and responsive structures, to transform a relatively disinvested urban neighborhood into a multicultural landscape that provides cultural, ecological, and production functions. The goal of resilience is not simply survival, but growth in the face of disruption. What is the Top Coastal City in the United States That is at Risk For the Greatest Overall Cost of Flood Damage? The top four cities alone account for 43% of the forecast total global losses. Incorrect. Miami is the top city in the United States. By 1684 all Native Americans were “sold” to European settlers. Red Hook is settled by Dutch immigrants, who created tidal mill ponds in low lying areas. British occupation of NY metro area. Entrepreneurs build ports along the coast. BASF opens first sales office in North America. Mass urbanization of the East River Shore. First use of Haber-Bosch process on industrial scale to produce synthetic ammonia. Red Hook is the busiest freight port in the world. During the Great Depression, shantytowns, known as “Hoovervilles,” are set up in the Red Hook neighborhood due to the large number of unemployed. Brooklyn Queens Expressway is planned and completed at a cost of $137 million. Robert Moses completes 13 expressways in New York City and Brooklyn. BASF opens new LEED double platinum HQ in Florham Park, NJ. 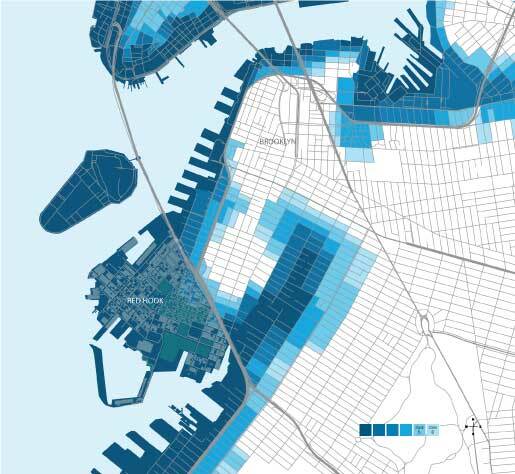 When the Federal Emergency Management Agency proposed new, expanded 100-year flood zones in 2014, the number of New York City buildings falling within them jumped from about 24,000 (by a 2010 estimate) to more than 84,000. The assessed value of properties in the zones increased from $58.6 billion to $129.1 billion. Most predictions say the warming of the planet will continue and will probably accelerate. Oceans will likely continue to rise as well, but predicting the amount is an inexact science. 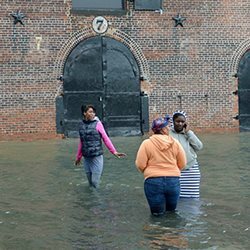 A recent study says we can expect the oceans to rise between 2.5 and 6.5 feet (0.8 and 2 meters) by 2100, enough to swamp many of the cities along the U.S. east coast. More dire estimates, including a complete meltdown of the Greenland ice sheet, push sea level rise to 23 feet (7meters), enough to submerge London. Six of the top 10 most expensive natural disasters in our nation were caused by coastal storms. In 2015, there were 10 weather and climate disaster events with losses exceeding $1 billion each across the United States. Although the coastal areas of the United States comprise only one-fifth of the land area of the contiguous 48 states, they account for more than half of the nation’s population and housing supply. In 1990, over 133 million Americans lived in the 673 counties along the Atlantic and Pacific Oceans, the Gulf of Mexico and the Great Lakes. Since 1960, population in these areas increased by 41 percent. These ideas represent an approach to solving problems of resiliency and sustainability that coastal cities around the world can adapt to their own needs. Share this project to make others aware of the proposed solutions for coastal cities like Red Hook. From the join Organization for Economic Co-operation and Development (OECD) and World Bank study Future Flood Losses in Major Coastal Cities, published in Nature Climate Change, August 2013. Interactive experience created in partnership with ion interactive.